If you are a Linux user, you might come across situation where you it would have been convenient to split large files before you can share them with your friends or send it across to your friends as attachments to the email. PDFSam for Splitting and Merging PDF Files. 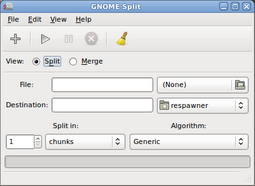 If you are looking for a easy to split and join files on Linux try GNOME Split, this tool allows users to split files and merge them back. 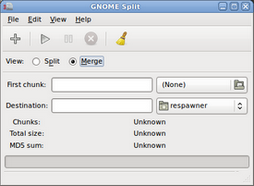 It is written in Java and uses a GTK+ user interface.The best part is that it can split files in generic file formats and supports formats of other file splitting programs and which can also be merged using the GNOME Split.It supports the following file formats : Xtremsplit file format, KFK file format and YoyoCut file format.The tool also has a Integrated File Verifier using MD5 Algorithm to check for file integration. GNOME Split makes it easy to split and merge files in Linux, with a easy to use front end and support for merging split file formats of other apps makes it more convenient while sharing the split files for merging on other Operating Systems. Very nice tip for linux users. Can we split windows file (files which work on NTFS coz NTFS not supported in linux) too?